Raise your hand if this is your FAVORITE salad. Someone decided to put the world’s best ingredients on a plate, and by someone, I guess I mean Robert Howard Cobb. What else could make this salad better? The answer: nothing. Nothing could make it better. 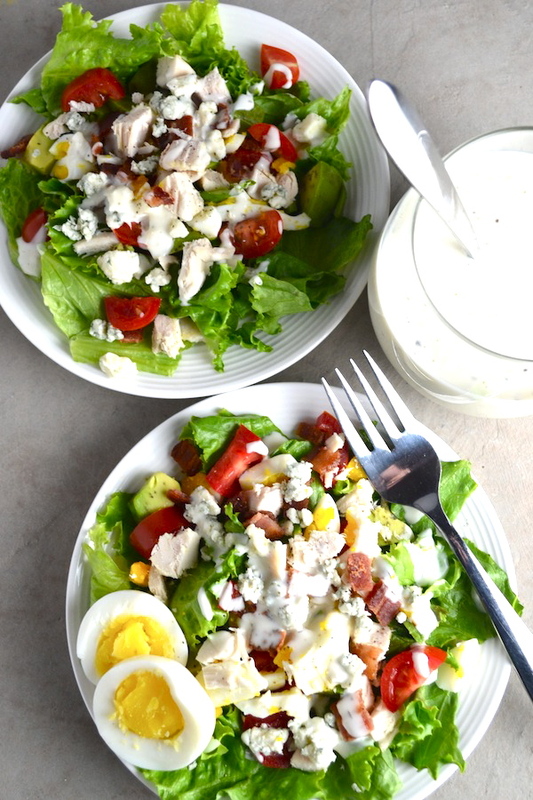 I mean, chicken, bacon, avocado, tomatoes, hardboiled eggs, and blue cheese = perfection. Now, you may be wondering why I claim this to be a healthy Cobb salad. 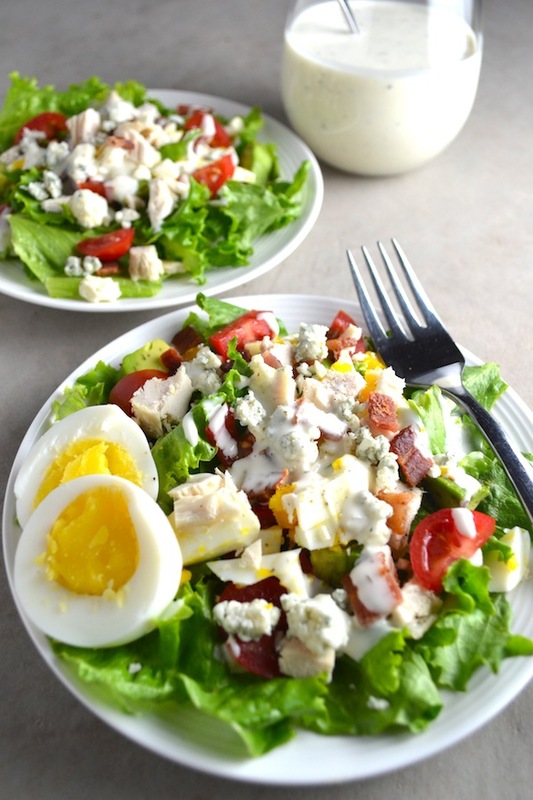 Well, some may think Cobb salad isn’t healthy because of you know the bacon, blue cheese, eggs, and avocado. 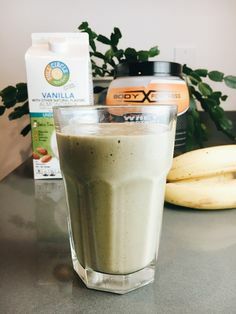 It has a lot of high calorie ingredients in it. But I think these high calorie foods are really good for you because they’re non-processed, real food calories. This Cobb salad is chuck full of healthy fats. But the quality of your Cobb salad ingredients will make a big difference in how healthy it can be. 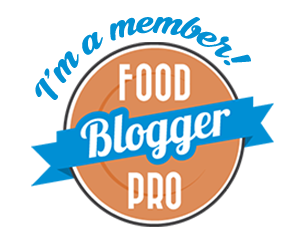 For example, I use chicken and eggs from pasture-raised chickens, and bacon from pasture-raised pigs. You can buy pasture-raised meat and eggs from some local farmers or retailers like Real Foods Market. I use organic green leaf or Bibb lettuce rather than iceberg, and organic tomatoes and avocados. And I top it with either my homemade ranch dressing or a store-bought organic dressing like Cindy’s Kitchen Buttermilk Ranch, Annie’s Homegrown Organic Ranch, or Simply Dressed Blue Cheese. Using these high quality ingredients will ensure you’re eating a pesticide-free, nutrient dense, healthy salad. The only negative feeling I have toward Cobb salad is it’s not the easiest salad to throw together. Having to prep the chicken, bacon, and hardboiled eggs can take some time. So, I only make Cobb salad when I have chicken and bacon leftovers. And I purposefully plan for it in my weekly meal plan. I hard boil a bunch of eggs on Monday, cook a whole roast chicken for dinner on Tuesday, fry bacon for breakfast on Wednesday, and then make a Cobb salad for dinner on Thursday. 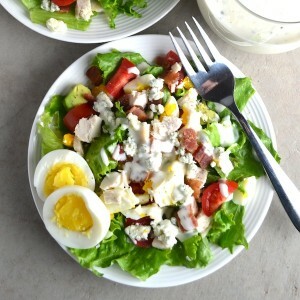 Combine lettuce, chicken, bacon, hardboiled eggs, avocado, tomatoes, blue cheese crumbles, and pepper in a large bowl. Top with blue cheese or ranch dressing. I like to use green leaf lettuce and/or Bibb lettuce. I use leftover chicken from a whole roasted chicken, but grilled chicken works great too.